Keep your child care or day-care centre a healthy environment with our professional cleaning service. Few things bring greater joy to a parent than knowing there child is settling in well and enjoying the time in child care. As parents entrust the delicate care of their children to you every day, you can rely on us to make sure that your childcare centre is kept safe, hygienic and compliant. With extensive cleaning of childcare centres across Victoria, we understand what is involved in cleaning childcare and activity centres, which means we know to look for any fingerprints, crumbs or any other surprises your little guests might leave behind. 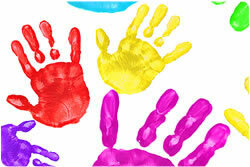 Children love to get hands on and messy, and that is important to encourage creativity and curiosity at a young age. That also means child care centres can be breeding grounds for germs and spreading of infections. With our services, your clients can be confident that their children are learning and playing in a clean, safe environment. With clients across Victoria, our child and day-care centre cleaning services are perfected. All our cleaning products are hospital grade and eco-friendly ensuring we maintain a safe environment for everyone. All staff have police checks and working with children clearances. We will take care of your childcare needs so you can focus on your very important little guests.